HKT Goeldner-Compressors for hydro-carbon refrigerants, especially propane (R290) are successful in operation since more than 20 years. With the modified models the application range was widened again. This works without any losses neither efficiency nor safety in operation. With the R290-compressor range “P” HKT Huber-Kälte-Technik fulfilled the strong demand on climate neutrally solutions for refrigeration an air-conditioning applications as well as heat pumps. 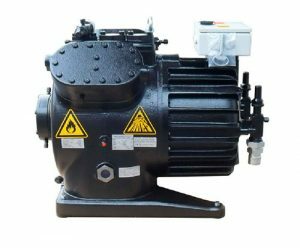 HKT-Compressor – Manufactory now offers for each customer a suitable product. On Chillventa 2018 HKT will display a high temperature chiller for max ambient temperature up to 100°C, working with a hydro carbon refrigerant being equipped with a semi-hermetic Goeldner-“P”-Compressor.